I love eating hard boiled eggs. Alone, as egg salad, or as deviled eggs — they are delicious and healthy. But for years I didn’t make them because I found it a hassle. I would get inconsistent results. Or, even if they were cooked properly, the peeling process was so overwhelmingly annoying that I would get frustrated and swear off attempting again. 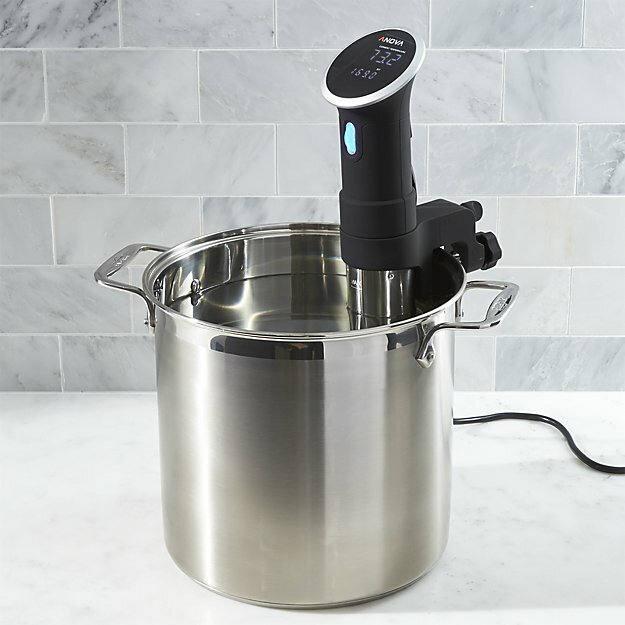 Using a sous vide cooker. 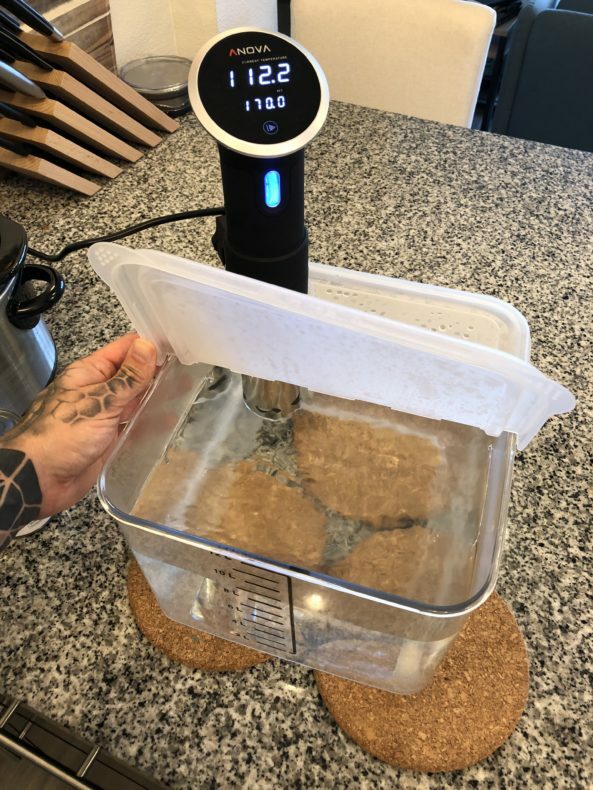 Last year, I got the Anova Wi-Fi enabled sous vide cooker, which is excellent, and I use about once a week. Besides being brilliant for steak, chicken, pork, and salmon, it is really good at precisely “boiling” eggs. The other thing I learned, via trial and error, is that how you cook the eggs determines how easily they peel, to some extent. Some eggs are easier or harder to peel based on their quality and age. But you can tilt the odds in your favor with the “temperature shock” method. 1. Prepare a large ice bath. I use a large plastic mixing bowl. 2. Turn on your sous vide to 170° F.
3. Boil water (3 to 5 inches) in the biggest pot you have. 4. Gently (but quickly) place eggs in boiling water, gently lowering them to the bottom with a side skimmer spoon. 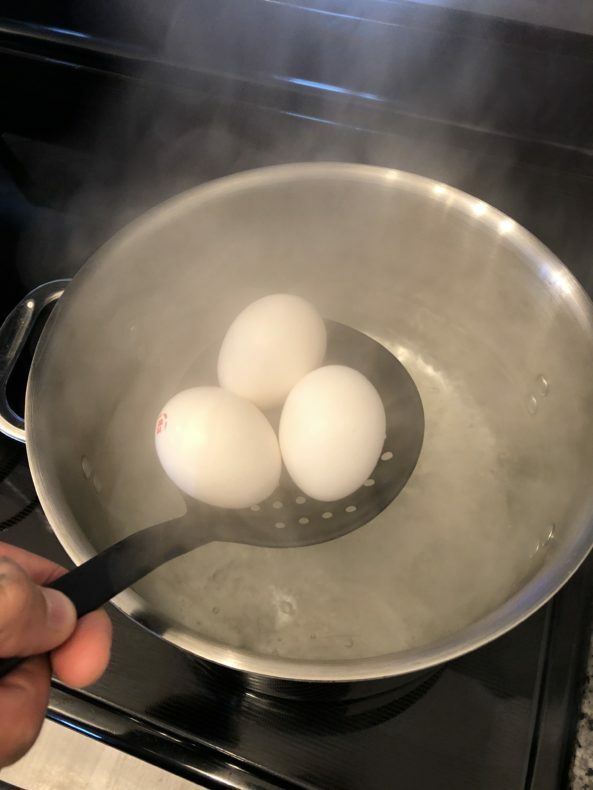 I like using a skimmer spoon because I can fit three eggs at a time, and the flat shape makes it easy to gently place the eggs at the bottom of the pot. Note: Some of the eggs will slightly crack from the quick temperature change, and a bit of egg white will leak out and instantly cook. This is fine. Leave those eggs in. Being super gentle will minimize this. 5. Boil the eggs for 3 minutes. 6. 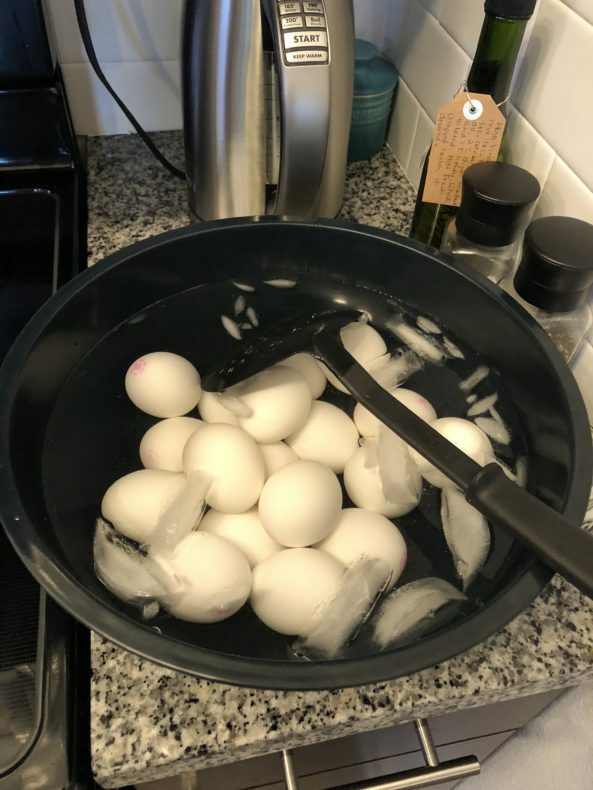 Remove the pot from heat and quickly (but gently) use your skimmer spoon to move the eggs to your ice bath, where they should sit for 10 minutes. 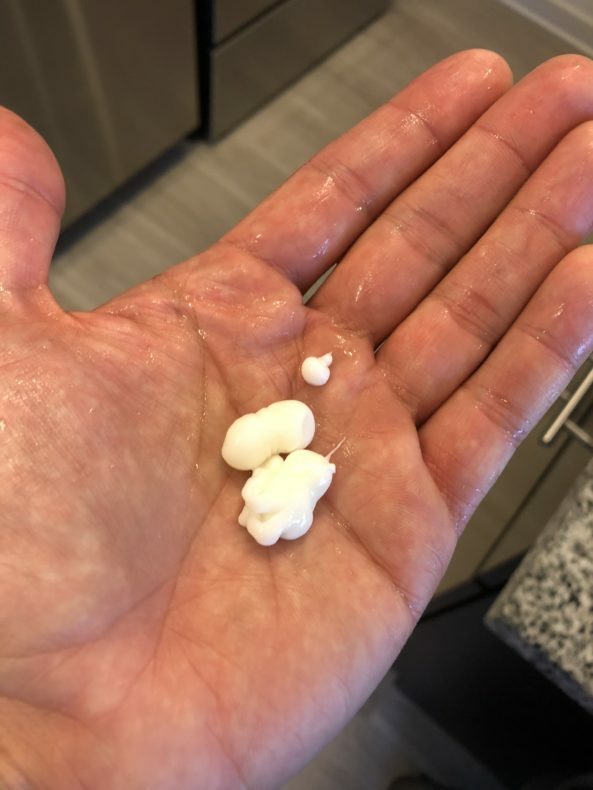 You can remove any loose egg white at this point, so it doesn’t clog your sous vide cooker. 7. 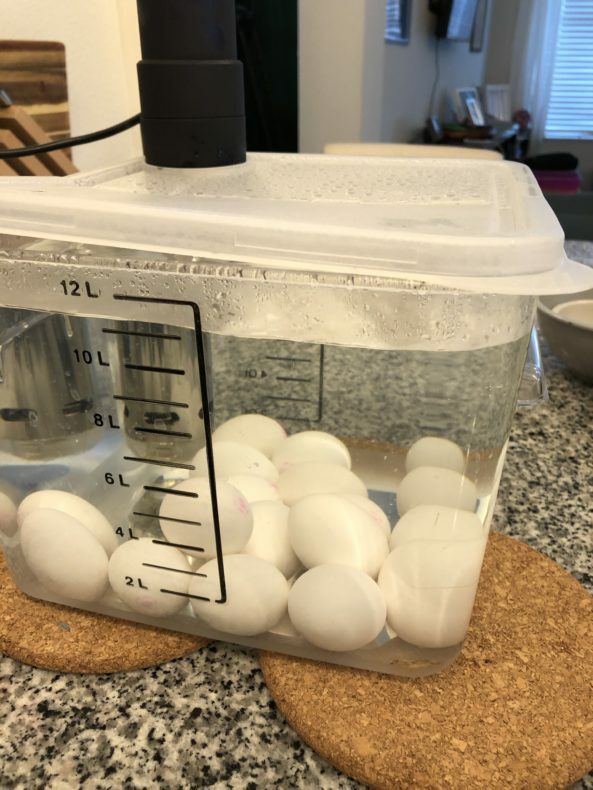 Once the sous vide temperature is reached, gently lower the eggs into your sous vide container. 8. Cook the eggs in the sous vide for one hour. 9. 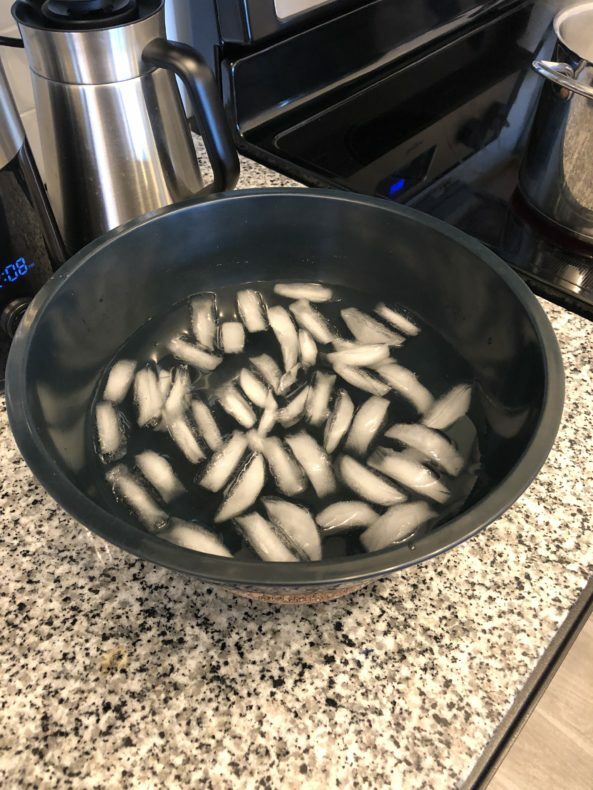 Remove the eggs and place them back in the cool leftover ice bath water. 10. Let the eggs cool for five minutes. 11. Refrigerate the eggs. Use within one week. 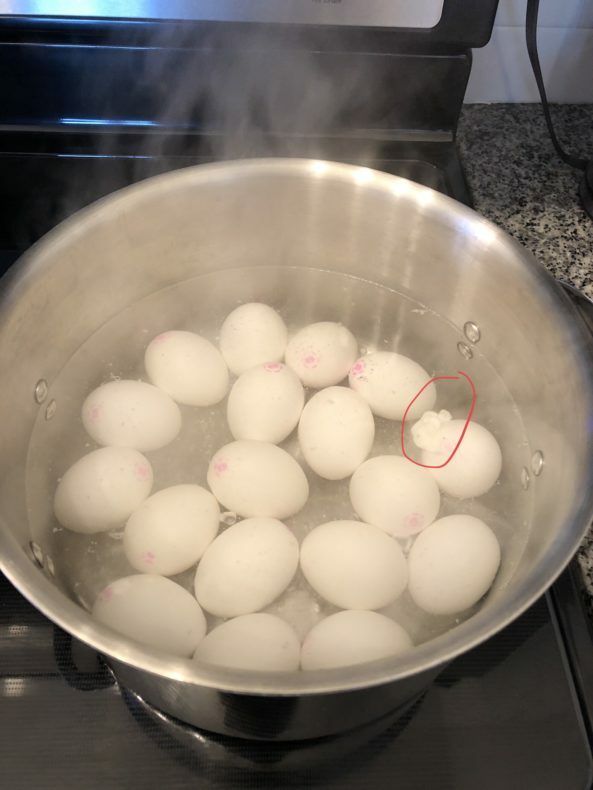 My theory is that the quick and sudden boil, followed by the ice bath chill, causes the egg white to pull away from the shell a bit, instead of sticking to it. When I peel the eggs, I do so under running water, and sometimes can remove the shell in a few large sections.